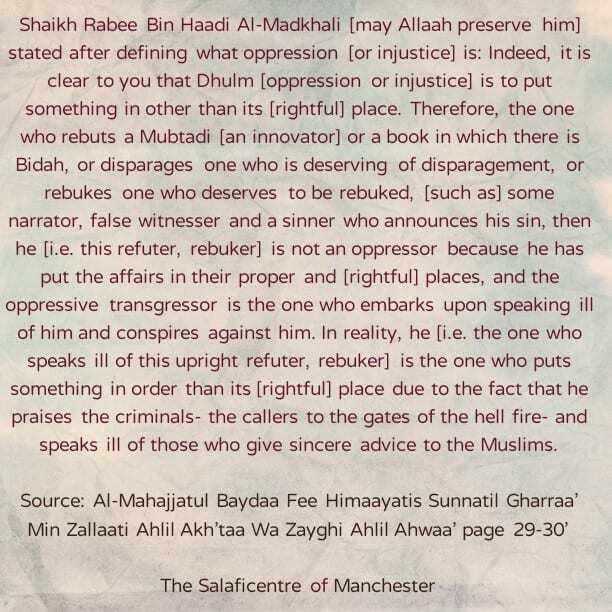 Shaikh Rabee Bin Haadi Al-Madkhali [may Allaah preserve him] stated after defining what oppression [or injustice] is: Indeed, it is clear to you that Dhulm [oppression or injustice] is to put something in other than its [rightful] place. Therefore, the one who rebuts a Mubtadi [an innovator] or a book in which there is Bidah, or disparages one who is deserving of disparagement, or rebukes one who deserves to be rebuked, [such as] some narrator, false witnesser and a sinner who announces his sin, then he [i.e. this refuter, rebuker] is not an oppressor because he has put the affairs in their proper and [rightful] places, and the oppressive transgressor is the one who embarks upon speaking ill of him and conspires against him. In reality, he (i.e. the one who speaks ill of this upright refuter, rebuker) is the one who puts something in order than its [rightful] place due to the fact that he praises the criminals- the callers to the gates of the hell fire- and speaks ill of those who give sincere advice to the Muslims.